to be built. award winning builders. 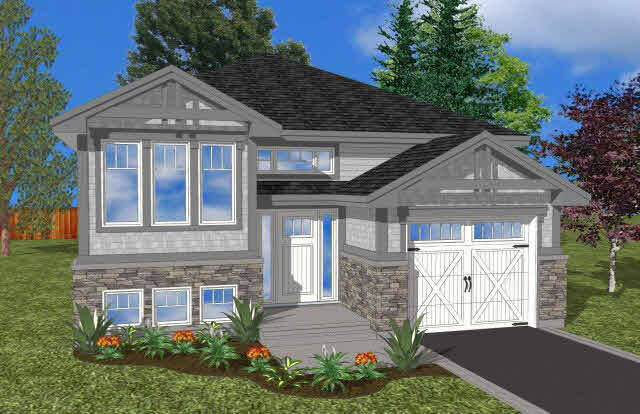 the fleming is a split entry design featuring two bedrooms and two bathrooms. the open concept living room, dining room, and kitchen lend themselves well to connected family living. choice of nickel or oil rubbed bronze finishes, up to 3 interior paint colours, choice of exterior colours and materials, upgraded kitchen standards with crown moulding and light valance, under cabinet lighting, custom ceramic tile shower in ensuite bath with glass doors, 5 1/4 inch base and 2 3/4 inch casings, stoop and apron window casings, your choice of interior door styles, engineered hardwood and ceramic on main floor, 9 foot ceilings on main floor, limited lifetime warranty on shingles, code blue? waterproofing, fully eavestroughed around house, engineered floor joists, subfloors glued and screwed, hrv and on demand hwt, paved drive.